Sunday Quote!- Does Science Limit Exegesis? | J.W. Wartick -"Always Have a Reason"
Sunday Quote!- Does Science Limit Exegesis? Now I think this is a pretty obviously controversial claim for a few reasons. First, the immediate question is how broad Davis and Stearley are intending this to be. After all, one might say that God creating the universe is “unacceptable” depending how one defines the scientific community. Of course, they do qualify the statement by noting that what they mean is that the evidence young earth creationists put forward can often, in principle, be tested for; and when tested, it fails muster. In this sense, I think that one might say the statement is acceptable. Second, one may object to this noting that science often changes consensus, so what is “unacceptable” today becomes in vogue tomorrow. A problem with this claim is that it flies in the face of the real, overwhelming evidence for an ancient Earth. I’ve examined this and many other arguments YECs put forth in my post on YEC arguments. Third, one might wonder exactly how Davis and Stearley think science and exegesis are supposed to interact. Though this is a far cry from the purpose of their book, statements like these beg the question of whether science really does limit exegesis. Answering Common Young Earth Creationist Arguments– I evaluate a number of arguments for young earth creationism. There are a large number of biblical, philosophical, and scientific arguments briefly answered here. Davis A. 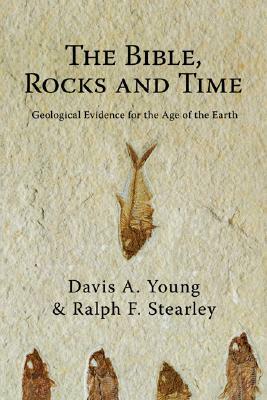 Young and Ralph F. Stearley, The Bible, Rocks and Time: Geological Evidence for the Age of the Earth (Downers Grove, IL: InterVarsity Press, 2008). « Really Recommended Posts 5/2/14- Hitler’s Philosophers, Lutheranism, and more! I just had this conversation yesterday regarding the difference between interpreting, understanding, and reconciling Scripture. As our knowledge increases, we have to reconcile what we know with what we understand Scripture to say. While I can appreciate the point – that we must not accept claims in our theology that are clearly unacceptable outside of our faith – it cannot simply be a one-way street. My assertion is that we must look for a way to reconcile our knowledge with the revelation we are given, and only if we have a clear reason to discount a particular theory or fact should we eschew that “truth” in favor of our understanding of Scripture. A good example is the idea of an eternal Universe. If that was the accepted truth among scientists and philosophers, we would have good reason as Christians to deny the theory. We would need to offer justification as to why we denied it, but I believe we would be right to do so. For YEC’s, I wouldn’t suggest that justifications such as those offered by “Answers in Genesis,” et al should be deemed “unacceptable,” simply because they fly in the face of modern science. They are acceptable, but I certainly wouldn’t be dogmatic about them without very good reason. It is a noble pursuit, in my mind, to seek scientific justification for an a priori belief, as long as we are then willing to follow the evidence. Reality limits exegesis. A lot of interpretations of a triumphalistic Messiah collapsed when Messiah came as a suffering servant, How many interpretations of Christ’s return have been shipwrecked by history and Christ’s non compliance with popular eschatologies? Reality/science/fact do not tell us how to interpret scripture, but they can show us when our interpretation is wrong. And the stronger exegetical case is for a suffering servant. And the stronger exegetical case is that we can’t predict the return of Christ. In each case, the positions we take have exegetical strength. And when we debate those things today, we do so on the basis of exegesis. If a Jew could show from the OT that the Messiah was not to suffer and die, then, Darach, you do realize that you’re just saying “damn the facts” in favor of another set of “facts” right? The suffering servant wasn’t the obviously stronger case, It was proved after the fact by Christ’s resurrection Isaiah 53 (Proved at least for those who trust in Christ and believe God raised him from the dead.) But 1st century Jews expected Messiah to be a conquering military hero. Would we have understood any better in their shoes? I don’t share your confidence. You need to be careful with texts whose meaning you think is obvious, if it wasn’t obvious to people in the past who don’t have the information we do. First century Christians expecting Christ’s return within “this generation” Matt 24 34 had a very obvious exegetical case. The facts proved otherwise. Similarly for Christians before Copernicus and Galileo the obvious plain meaning of Joshua 10 and Eccl 1:5 is that it was the sun was moving across the sky and that after it sets it hurries to get to the place it rises. Creationists realise it is the earth rotating, not the sun moving, and interpret these passages to fit what they know from science. The problem creationists have, at least any I have spoken to, is they find it impossible to understand what ‘the plain meaning of the text’ was for church fathers and scripture scholars before modern astronomy. If things were as you say, then Paul wouldn’t have had any stronger case to make than the Jews he was arguing with. Yet the NT clearly thinks that Scripture is on the side of Christians and it doesn’t indicate that Scripture is only shown to be on the side of Christians after Christ. Rather, that’s the position you’re forced to take to maintain your position. Nice subjectivism there. So by the same logic, we could say theism only has the stronger arguments for atheists who happen to trust in theism. I wonder if anyone else here is willing to go that far, Darach. But 1st century Jews expected Messiah to be a conquering military hero. Would we have understood any better in their shoes? I don’t share your confidence. You need to be careful with texts whose meaning you think is obvious, if it wasn’t obvious to people in the past who don’t have the information we do. You need to be careful not to have so much confidence in your own position. You’re so confident in your own position that Scripture lacks perspicuity here. Maybe you need to take a closer look at the exegetical arguments. First century Christians expecting Christ’s return within “this generation” Matt 24 34 had a very obvious exegetical case. The facts proved otherwise. Actually I read Matthew 24:34 in a way that is entirely consistent with what first century Jews would have understood and I think I have the stronger exegetical case. I admit that dispensationalists or premils have a problem with that passage… because they have a weaker exegetical position. Similarly for Christians before Copernicus and Galileo the obvious plain meaning of Joshua 10 and Eccl 1:5 is that it was the sun was moving across the sky and that after it sets it hurries to get to the place it rises. Knew it wouldn’t be long before this was trotted out. It’s almost like you haven’t had a discussion on age-of-earth issues until someone trots out Joshua 10. But I don’t think you’ll get any mileage out of it with me. I think Scripture is speaking phenomenologically and there is no exegetical case to be made that these texts are meant to be statements of modern physics or the idea that the earth isn’t an inertial frame of reference. That’s what would be relevant here… not just what people assumed about a text, but what is exegetically warranted from a text. So it does you no good to point out what people assumed about a text without exegetical warrant. Creationists realise it is the earth rotating, not the sun moving, and interpret these passages to fit what they know from science. The problem creationists have, at least any I have spoken to, is they find it impossible to understand what ‘the plain meaning of the text’ was for church fathers and scripture scholars before modern astronomy. Your problem is in your method. In order to discover if Scripture is clear, you turn to consensus instead of turning to Scripture and the exegetical arguments that have been offered. This is strangely similar to the fault of the authors in this quote: they turn to consensus. That’s not a very reliable method for arrive at well reasoned, true conclusions. This is a horrible quote and these are the sort of statements made by an OEC that will only confirm all the fundy YEC suspicions that OEC is from the devil. Now I don’t think the fundy YEC is correct, but when I see OEC making statements like this (unless the comment is seriously qualified through other parts of the book) I think these guys are only hurting the OEC movement. Either OEC will agree with them, in which case they are left with a horrible hemeneutic, or else OEC will disagree with them but guys like this make statements that make it that much harder for them to dialogue with YEC. It’s like having Fred Phelps call himself a Christian. When he does that, he’s a problem for the church. Either people are suckered and confused by Phelps or else Phelps makes it that much harder for Christians to appropriately reach out to homosexuals. Now I’m not saying what these guys said is as bad as Fred Phelps, I’m only trying to illustrate how if I was an OEC, I would not want these guys on my team making these sorts of statements. The church must be guided by Scripture first and foremost. Now if these gentlemen have set forth an *exegetical* argument that Scripture is silent or underdetermined on this scientific issue, then sure the church can leave the scientific community to it’s musings… but even here the quote can give us a wrong impression. In that case, what the scientific community says about the age of the earth is about as relevant to the church as what the scientific community says about the number of electrons on an atom. The church shouldn’t be interested in weighing in on such issues. It would be hubris for scientists to tell the church that they need to fall in line with that, just as it would be hubris for the church to tell science it needs to fall in line with baptism. After all, one might say that God creating the universe is “unacceptable” depending how one defines the scientific community. Of course, they do qualify the statement by noting that what they mean is that the evidence young earth creationists put forward can often, in principle, be tested for; and when tested, it fails muster. In this sense, I think that one might say the statement is acceptable. i. So your first hypothetical objection is that this same sort of reasoning could be used to argue against other Christian doctrines that, presumably, we would not want to give up. So we can’t apply the authors’ reasoning consistently. But your response to this objection is merely to point out that it can’t be applied to this other issue–creation–yet. That strikes me as inadequate. I suspect that many cosmologists are hopeful that we will have a testable model of the universe (or multiverse) which shows it to be eternal. But we don’t need to have any actual example to show the problem with the principle. It’s enough to consider the hypothetical: if scientific consensus comes to be that the universe is eternal and they can test it, should the church abandon the doctrine of creation (that the universe began to exist)? (2) Our interpretation of Scripture is wrong. (3) The science is wrong. Currently (2) is the most popular option. But (2) has its limits. At some point, Christians lose all credibility as rational if they apply (2) to cases where Scripture is clearly saying one thing and Christians are saying something different, just to salvage their faith. If the exegetical merits of creation are strong then (1) and (3) should be our considered options. By first exegeting Scripture, we treat Scripture with integrity. We let Scripture speak for itself. Christians wouldn’t take Beowulf and say “Okay, now we know science says this…. therefore Beowulf must be saying this…” So they’ll need to provide some excellent reasons for their approach Scripture. A problem with this claim is that it flies in the face of the real, overwhelming evidence for an ancient Earth. I’ve examined this and many other arguments YECs put forth in my post on YEC arguments. In other words, science won’t change on this issue. But Christian apologists take contrary positions in the face of such claims regarding other issues too: e.g., intelligent design, the historical Adam. In either case, I could find you scientists who find the evidence for neo-Darwinism and no first pair of humans to be overwhelming. Yet many Christians aren’t willing to give up these issues. They think they can poke holes in the science… but then YEC think they can poke holes in the science too. iii. Your third hypothetical objection is really just a question. But this hints at the objection I would raise: at some point, we have to allow Scripture to speak for itself. We can’t take our faith seriously and we won’t be taken seriously by outsiders if we let scientific consensus determine what the church believes. It’s not always easy to determine what Scripture is saying and it’s not always easy to determine what the scientific data is actually saying (e.g., as I understand it, scientists used to disdain and mock plate-tectonics). But many Christians are in a rush to make Scripture less clear, because the scientific consensus has declared itself to be clear and true. That’s not a healthy attitude on the part of Christians. I highly recommend the book Refuting Compromise by Jonathan Sarfati. If you can’t deal with that book, then you haven’t dealt with the best arguments Young Earth Creationists really have to offer. The truth is, the science behind long ages is not sound. It’s propped up by assumptions and circular reasoning, and it’s not allowed to be questioned by the keepers of the “reigning paradigm”. This kind of behavior has been well-documented, for example in the documentary Expelled by Ben Stein. The Bible teaches death (physical death, not just spiritual death) is a direct result of sin. Get rid of that, and you’ve undermined the core of the Bible.
. and it doesn’t indicate that Scripture is only shown to be on the side of Christians after Christ. They say hindsight is 20:20. The fact is nobody came up with this idea from the plain reading of the OT scriptures before Christ fulfilled them. Yes faith in Christ is rational, but I am dubious when people put so much trust in theirability to prove Christianity rationally. We walk by faith not by sight. Nicodemus understood when Jesus explained it, but the fact remained that he had read the scriptures many times before and not understood. If it was clear then 1st century Jews would have realised it. They didn’t. You are the one who thinks he would have understood scripture better than Nicodemus the teacher of Israel. Hindsight. Would your interpretation have been obvious or appealing to persecuted 1st century beleivers eagerly awating the Lords return? It’s a pretty important lesson for the church, this isn’t the first time science has show an interpretation of scripture is wrong. Rejecting science for the traditional plain meaning of scripture only brough the church and scripture into disrepute. Who told you scripture was speaking phenomenologically? Does scripture teach that anywhere? Why not simply take the plain statement of a historical narrative like Joshua at face value? Velocity may be relative, acceleration certainly isn’t. The earth spinning (conservation of angular momentum) is very different from the sun orbiting the earth (which would require the earth to have the gravitational attraction of a black hole). If you know the speed of a satellite you can calculate its position in a geocentric frame of reference. But you cannot use the geocentric frame of reference to calculate the thrust to manoeuvre the satellite, because the earth really is rotating. People before Copernicus turned to scripture and exegesis to understand these passages. They got it wrong. It is hard for creationist to argue for the plain meaning of scripture when they cannot see what the plain meaning of Joshua was to church fathers. How do you know that nobody came up with that reading prior? It seems reasonable to think Isaiah knew what he was talking about. “so much trust” is vague. How much trust? Scripture indicates that Paul proved from the OT that the Messiah was to suffer and die. It’s reasonable to think he did this by showing he had the better exegetical case. Scripture was on Paul’s side. Is that too much trust? If so, why? Because you say so? You’re avoiding the point. Jesus thought Nicodemus *should have known better*. According to you, he shouldn’t have and the reason you think he shouldn’t have known better is that he did’t know better and, you assume, no one else did either. What? Not even sure what this means. Who is the “he” in “he would have understood…”? And Jesus’ point is that Nicodemus should have understood the things he was talking to him about… so I have no idea why you would think it odd that someone (“he”) would have understood Scripture better than someone who should have understood it better. Would your interpretation have been obvious or appealing to persecuted 1st century beleivers eagerly awating the Lords return? Yes. I think it’s evident from the text, which the audience would have been able to exegete and would have had access to the one who wrote it or to someone close to the one who wrote it. So far, you’ve provided me with absolutely no reason to think I’m wrong about any of this. You’ve done nothing more than express some incredulity, assume no one got it right and that if they didn’t get it right then you assume it’s because of something unclear in the text. You’re giving me one big non-sequitur. The lesson is actually against Young and Stearley. The church at the time was following scientific consensus. They married scientific consensus to Scripture. It’s actually people like Young and Stearley want to repeat this mistake in history. Scientific consensus says ‘x’ (e.g., Ptolemaic system), so the church must see how Scripture has really been saying ‘x’ too. Who told you scripture was speaking phenomenologically? Um, my dog spoke to me in a dream. Why would it matter? Does scripture teach that anywhere? Not that I know of… again, not sure why you think it matters. Did I say something like “I believe Scripture teaches Joshua 10 is phenomenological”? If I did make such a statement, it must have slipped my mind… but I happily retract said statement. Why not simply take the plain statement of a historical narrative like Joshua at face value? That’s exactly what I am doing. The plain understanding of Joshua 10 is that he’s giving a phenomenological description of what the sun did, not a model of relative motion or the solar system or anything like that. I’ll leave that to you and others who are better qualified to discuss it. It’s my understanding that there is no absolute motion or rather absolute inertial frame of reference whereby you can say “x moves/does not move” in the sense in which they may have thought during Galileo’s day. Then why did Daniel need visions explained to him? Assuming people in the bible understood a text the way you do is a real failing for creationists. The fact is 1st century Jews were expecting a conquering Messiah. Speculating there might have been a few who understood the text the way you do doesn’t change how the texts were understood by the vast majority. I was discussing your trust in proofs of theism there. The problem of Nicodemus and first century Jews is they were too bound up with zeal for the law to see the deeper message of grace and transformation. Jesus’ rebuke of a teacher of Israel for not digging deeper does not mean this was obvious to anybody who read the text. The problem was that their religious and cultural preconceptions coloured their understanding of ‘the plain meaning of the text’, just as our religious and cultural preconceptions colour what seems the pain meaning to us. We cannot assume the way we read a text and the plain meaning to us, was how people in a different time culture and religious background would have read the text. I am saying you think you would have understood the OT better than Nicodemus. Seems over confident to me. Remember you wouldn’t have the advantage of Jesus, the apostles and two millennia of Christian scholarship explaining the meaning of the OT text to you. All you would have going for you is the text, Jewish tradition and 1st century Jewish scholarship, just like Nicodemus had. If you are unwilling to step back from your assumption that the way you read the text is the obvious and only meaning, and look at how the text would have appeared to someone without your after-the-fact knowledge, then nothing I can say will convince you. Not even the fact that people in different ages read these text very differently to you, whether 1st century Jews reading about Messiah, 1st century Christians expecting his return, or Christian scholars for 1500 years understanding the geocentric texts geocentrically. They must all have been pretty dim not to understand the pain meaning of the text. But if they didn’t understand it, how can it be the plain meaning of the text? People didn’t think the sun went round the earth because science told them. They thought the sun went round the earth because that’s what it looks like. Most of the church did accept science when it told them things that weren’t obvious, like the earth being a ball. Literalists like Cosmas and Lactantius brought the church into disrepute with their antiscience flat earth interpretation. But the church wasn’t following science with geocentrism, science simply agreed with what was already obvious everyone. The geocentric interpretation of these passages was the plain meaning of the text to anyone who ever spent a day outdoors. We are talking about the plain meaning of the text. Unless the scripture tells you to interpret it phenomenologically, a phenomenological interpretation is not the plain meaning. Joshua commanded the sun to stand still, it stopped and stood still, then after the miracle it hurried to the place it set. The plain meaning of the text is that the sun actually stopped moving across the sky at Joshua’s command and that it started moving again when he was finished. It is also pretty obvious from the fact that Joshua addressed his command at sun, that he also assumed it was the sun that was doing the moving. An inertial frame of reference is one that isn’t accelerating. If you are driving along in a car (ignoring the earth’s rotation etc.) the cows seem to be moving past you, from your inertial frame of reference they are, they are. But if the driver accelerates, brakes, or drives around a bend your inertia will throw you back forward or to the side. Even if you were right, it would show how preconceptions colour what appear to be the plain meaning of the text. Your scientific and theological preconceptions colour your reading of the text too. But there wasn’t any theological pressure until Copernicus overthrew the traditional interpretation, as for scientific pressure, science merely confirmed what seem obvious already. If you want to know the plain meaning what you need to do is step back, as fas as anybody can, from you own preconception and try to understand how the text appear to people without our modern understanding. If you don’t approach the text trying to make it fit our modern understanding of astronomy, then the Geocentric interpretation really is the plain meaning. The consistent interpretation of these passages over one and a half millennia, confirms that. If there was another obvious plain meaning, scholars would have come up with it. Forgot about this discussion. JW’s tweet reminded me. You’re very verbose with very little of that verbosity moving the discussion forward. You set up a bunch straw-men, knock them down, and then simply repeat yourself. Then why did Daniel need visions explained to him? You seem to be under the impression that my position was that everything in Scripture is perfectly clear. That’s a straw-man. Assuming people in the bible understood a text the way you do is a real failing for creationists. You make the same assumption, unless you believe that nothing you currently believe about what the Bible says was believed by people contemporary with Scripture’s writing. Of course you don’t assume that *everything* you believe about the Bible was believed by contemporaries of the Bible’s writings. But neither do I. You’re just implying another straw-man. The fact is 1st century Jews were expecting a conquering Messiah. This is you repeating yourself, as though repeating yourself constitutes an answer to the response I already gave to this argument. The fact that someone in the 1st century believed ‘x’ is not sufficient reason to think the best exegetical case for text ‘y’ is ‘x’. The rest of what you say in your lengthy post doesn’t raise the bar any, so I’ll leave it at this.